Rebecca and Osborn Spriggs* suffered the loss of their two-day-old twin boys on January 20th, in 1844. The brothers were buried at Bethel Burying Ground. Two-day-old twin brothers died this date, January 20th, in 1844 of debility** and were buried at Bethel Burying Ground. Their parents were Rebecca, 23 years old, and Osborn Spriggs, 34 years old. Ms. Spriggs was born in Delaware and Mr. Spriggs was born in Maryland. He was employed as a waiter and she worked in the home, according to the 1850 U.S. Census. In the 1847 Philadelphia African American Census, Ms. Osborn reported that she worked as a wash woman. According to the 1850 U.S. Census, Rebecca and Osborn Spriggs had three other children at the time of the twins’ deaths. They included Ellen (3 y/o), William (4 y/o), and Mary (5 y/o). Sadly, Ellen died a year after the twins, most likely from a heart condition. She also was buried at Bethel Burying Ground. The 1850 Census reported that a 15-year-old James Spriggs also lived with the family. He was employed as a barber. His relationship to the family is not stated. After the twins’ deaths, Rebecca Spriggs went on to have at least two other children, Margaret and Rebecca, Jr. who were five years old and three years old respectively in 1850. The pin is pointing to the approximate location of 201 Lombard Street. The Spriggs family lived in a one-room shanty in the rear of 201 Lombard Street that was located between 6th and 7th Streets on Lombard Street. They paid $3.50 a month for their rent. Mr. Spriggs earned $15 a month working as a waiter, according to the 1847 Census. Their home was across from a crowded, dirty, crime-ridden square, where prostitutes, policymakers, gambling rooms and speakeasies abounded. It was packed with dilapidated tenements filled with hundreds of black children and adults living in squalor; often in dank windowless basements without sanitary facilities. But because of the cheap rents, it was often the first Philadelphia address of newly arrived freed slaves in the antebellum era. In the early 1900s, these tenements were torn down and replaced by Starr Playground, a city playground. The Spriggs twins were buried on a cold day in December 1844 where snow started falling at 11 o’clock in the morning and continued through the night. **Ms. Spriggs gave birth to several healthy children before and after the twins, so the “debility” or failure to thrive likely was due to the twins being premature and not able to nurse. 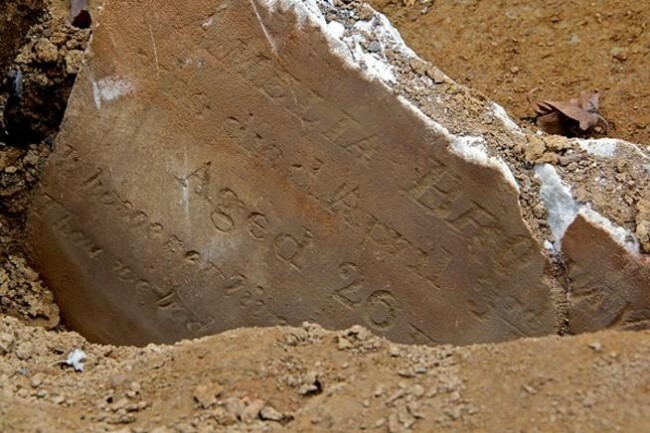 ← Sixty-year-old Sarah Benson died this date, January 19th, in 1850 and was buried at Bethel Burying Ground.